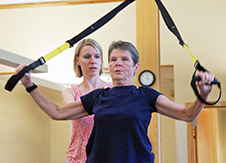 At the Institute for Health and Human Performance we are committed to providing education on various health topics as a resource for our clients and the Upper Valley Community. We produce monthly e-newsletters and quarterly printed newsletters filled with information on the various areas of health services that we offer. We also provide seminars throughout the year on various topics that are free and open to the community. Sign up here to stay informed of our events and receive our monthly emails. Is Your Back Pain Biased? Experience a day in the life at Cioffredi & Associates in this time-lapse video. We used GoPro technology to take a photo every 10 seconds over the course of our 12 hour clinical day. The images were then stitched together into this one minute and 21 second video. We had fun doing this project to show off the new clinic! Managing the Many Costs of Low Back Pain Low back pain is one of the most common conditions that we treat here in our clinic. In fact, it is such a common complaint that it is documented as the leading cause of activity limitation and work absence in the world…. Plantar Fasciitis: The Pain That Won’t Go Away? Heel pain is a common complaint among approximately 2 million people per year, and nearly 10% of the population over a lifetime. 1 The diagnosis for pain in the heel or arch of the foot is called plantar fasciitis. I’m always impressed when folks have indicated that their problem took a year to heal. Muscle and connective tissue usually heals much more quickly than that. Are there other factors that are stimulating the pain?…. The Mystery of Tennis Elbow The term ‘tennis elbow’ was first used in 1883 by Major in his paper “Lawn-tennis elbow”1; and while it can be seen in sports that have repetitive movement of the elbow (such as tennis), the majority of people who get tennis elbow have never even stepped foot on a tennis court…. Tennis Elbow: Not Just for Tennis Players Tennis Elbow, or Lateral Epicondylitis, is a common overuse injury that we see in the clinic. While it can be seen in sports that have repetitive movement of the elbow (such as tennis), the majority of people who get tennis elbow have never even stepped foot on a tennis court. According the American Physical Therapy Association, less than 5% of tennis elbow cases are tennis players…. Trigger Point Dry Needling: Applications & Evidence Trigger Point Dry Needling (TDN) has been used around the world for decades, and in more recent history has become an important tool for Physical Therapists. During this procedure a solid filament needle (like those used in acupuncture) is inserted into the muscle to help relieve pain…. Got Headaches? The PT Cure Explored Headaches can come from a variety of sources – stress, allergies, caffeine or alcohol withdrawal and sleep disorders – but they can also be caused by the neck (cervicogenic headaches). While many people may turn to a bottle of Ibuprofen for headache relief, when your headache is cervicogenic in nature, the medicine alone doesn’t correct the cause of the problem…. Reduce Osteoarthritis Pain with Manual Physical Therapy & Exercise Osteoarthritis (OA), sometimes referred to as degenerative joint disease, is the most common form of arthritis. If you are suffering from pain associated with OA, you are not alone. OA affects nearly 27 million Americans1, and it is projected to affect nearly 67 million by the year 20302…. Are You Living with Back Pain? It’s well known that about 8 out of 10 people will experience a significant back problem in their lifetime. According to the American Physical Therapy Association approximately 25% of people in the US (at any given time) report having lower back pain in the last three months…. Knee Pain: Finding the Source The source of knee pain can be quite variable and complex. Accurate diagnosis of the cause of the pain is fundamental to providing appropriate treatment and getting lasting results…. Patellofemoral Pain Syndrome (Also Known As “Runner’s Knee”) Anterior knee pain is a common complaint among many people, especially among active individuals. Approximately 70% of anterior knee pain that comes from patellofemoral disorders will resolve with conservative treatment like physical therapy.1 Discussed below are some of these problems, causes, symptoms and what is addressed in physical therapy…. Is it REALLY Carpal Tunnel Syndrome? Simply speaking, Carpal Tunnel Syndrome occurs when the median nerve, which runs from the forearm into the hand, becomes pressed or squeezed at the wrist. This is a well known condition that is one of the most commonly treated problems by hand therapists. The most common symptoms of Carpal Tunnel Syndrome (CTS) include numbness, tingling and sometimes pain within the palm side of the thumb, index, middle and a partial area of the ring finger…. Functional Movement Screen: Unlocking the Secret to Performance The Functional Movement Screen (FMS) was originally developed in 1995 to collect “objective data for statistical analysis of human movement patterns with respect to functional performance and injury prevention.”1 Today FMS is widely used to train and prepare professional and elite level athletes to improve performance and reduce risk of injury. At Cioffredi & Associates we are now offering FMS to help athletes unlock the secret to increased performance. Golf: Injury Prevention Techniques that Could Save Your Season While many think of golf as a fairly relaxed or low impact game, it can actually be quite physically demanding, and if your body is not properly prepared, it can cause a host of injuries. Research has shown golf to have a surprisingly high rate of injury, with PGA tour players averaging two injuries per year, and as many as one third of elite touring athletes playing injured at any given time.1,2…. Off-Season Training Gains Off-season training is one of the most beneficial ways to improve an athlete’s game. For the dedicated athlete that is always asking “What can I do to get better?” one answer is weight training…. The New Age of Stretching: A Look at Dynamic Flex When we think of “traditional” stretching for athletic purposes, you may envision prolonged poses for areas like your hamstrings, quads, IT band, etc. This is static stretching. There has been a lot of debate in sports medicine as to the effectiveness and appropriateness of this form of stretching…. Speed Development Almost every sport involves an element of speed, whether it’s sprinting to a loose ball or flying past a competitor in the last hundred meters of a race, speed is a key component in nearly all sports…. Peaking for Maximum Performance Understanding and executing an effective training peak is an essential component for an athlete to be at their best possible performance level for competition….